┬й 2013 GIGA-BYTE TECHNOLOGY CO., LTD. All rights reserved. 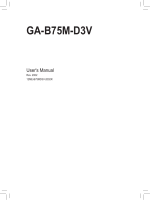 The trademarks mentioned in this manual are legally registered to their respective owners. 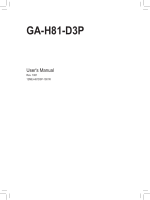 Information in this manual is protected by copyright laws and is the property of GIGABYTE. Changes to the specifications and features in this manual may be made by GIGABYTE without prior notice. any means without GIGABYTE's prior written permission. ┬Д┬Д For quick set-up of the product, read the Quick Installation Guide included with the product. ┬Д┬Д In order to assist in the use of this product, carefully read the User's Manual. drivers, or when looking for technical information. The box contents above are for reference only and the actual items shall depend on the product package you obtain. The box contents are subject to change without notice. For detailed product information/limitation(s), refer to "1-2 Product Specifications." тАвтАв Prior to installation, make sure the chassis is suitable for the motherboard. warranty sticker provided by your dealer. These stickers are required for warranty validation. installing or removing the motherboard or other hardware components. sure they are connected tightly and securely. тАвтАв When handling the motherboard, avoid touching any metal leads or connectors. keep your hands dry and first touch a metal object to eliminate static electricity. motherboard circuit or its components. тАвтАв Do not place the computer system on an uneven surface. тАвтАв Do not place the computer system in a high-temperature environment. components as well as physical harm to the user. product, please consult a certified computer technician. and enable the multi-channel audio feature through the audio driver. *Available applications in APP Center may differ by motherboard model. for the software listed in the "Unique Features" and "Bundled Software" columns. тАвтАв Make sure that the motherboard supports the CPU. CPU to prevent hardware damage. тАвтАв Apply an even and thin layer of thermal grease on the surface of the CPU. of the CPU may occur. card, memory, hard drive, etc. Locate the alignment keys on the motherboard CPU socket and the notches on the CPU. automatically during the process of re-engaging the lever after you insert the CPU. same capacity, brand, speed, and chips be used. memory to prevent hardware damage. тАвтАв Memory modules have a foolproof design. A memory module can be installed in only one direction. If you are unable to insert the memory, switch the direction. Channel memory mode will double the original memory bandwidth. Due to CPU limitations, read the following guidelines before installing the memory in Dual Channel mode. 1. Dual Channel mode cannot be enabled if only one DDR3 memory module is installed. the same capacity, brand, speed, and chips be used for optimum performance. expansion card to prevent hardware damage. keyboard/mouse, USB printer, USB flash drive and etc. Use this port to connect a PS/2 mouse or keyboard. The D-Sub port supports a 15-pin D-Sub connector and supports a maximum resolution of 1920x1200@60 Hz. Connect a monitor that supports D-Sub connection to this port. is 4096x2160@24 Hz, but the actual resolutions supported are dependent on the monitor being used. configurations are supported during the BIOS Setup or POST process. The USB 3.0 port supports the USB 3.0 specification and is compatible to the USB 2.0/1.1 specification. Use this port for USB devices such as a USB keyboard/mouse, USB printer, USB flash drive and etc. describes the states of the LAN port LEDs. The default line in jack. Use this audio jack for line in devices such as an optical drive, walkman, etc. to connect front speakers in a 4/5.1/7.1-channel audio configuration. The default Mic in jack. Microphones must be connected to this jack. multi-channel audio feature through the audio driver. device and then remove it from the motherboard. an electrical short inside the cable connector. тАвтАв First make sure your devices are compliant with the connectors you wish to connect. cord from the power outlet to prevent damage to the devices. been securely attached to the connector on the motherboard. power supply cable to the power connector in the correct orientation. lead to an unstable or unbootable system. The motherboard has a 4-pin CPU fan header (CPU_FAN) and a 4-pin system fan header (SYS_FAN). system fan be installed inside the chassis. may result in damage to the CPU or the system may hang. тАвтАв These fan headers are not configuration jumper blocks. Do not place a jumper cap on the headers. supports RAID 0, RAID 1, RAID 5, and RAID 10. Refer to Chapter 3, "Configuring SATA Hard Drive(s),"
for instructions on configuring a RAID array. according to the pin assignments below. Note the positive and negative pins before connecting the cables. will be heard if no problem is detected at system startup. LED is on when the hard drive is reading or writing data. to perform a normal restart. a chassis with a chassis intrusion switch/sensor. and the pin assignments are matched correctly. connector and the motherboard header will make the device unable to work or even damage it. тАвтАв The front panel audio header supports HD audio by default. тАвтАв Audio signals will be present on both of the front and back panel audio connections simultaneously. please contact the chassis manufacturer. optional 3.5" front panel that provides two USB 3.0/2.0 ports, please contact the local dealer. optional USB bracket. For purchasing the optional USB bracket, please contact the local dealer. тАвтАв Do not plug the IEEE 1394 bracket (2x5-pin) cable into the USB header. outlet to prevent damage to the USB bracket. COM port cable, please contact the local dealer. LPT port cable, please contact the local dealer. level, or the CMOS values may not be accurate or may be lost. 1. Turn off your computer and unplug the power cord. 4. Plug in the power cord and restart your computer. тАвтАв Always turn off your computer and unplug the power cord before replacing the battery. тАвтАв Replace the battery with an equivalent one. Danger of explosion if the battery is replaced with an incorrect model. (the positive side should face up). тАвтАв Used batteries must be handled in accordance with local environmental regulations. the CMOS values, use a metal object like a screwdriver to touch the two pins for a few seconds. тАвтАв Always turn off your computer and unplug the power cord from the power outlet before clearing the CMOS values. configure the BIOS settings (refer to Chapter 2, "BIOS Setup," for BIOS configurations). 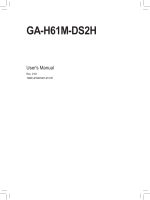 the user to modify basic system configuration settings or to activate certain system features. keep the configuration values in the CMOS. To access the BIOS Setup program, press the <Delete> key during the POST when the power is turned on. тАвтАв Q-Flash allows the user to quickly and easily upgrade or back up BIOS without entering the operating system. may result in system malfunction. The following startup Logo screen will appear when the computer boots. to accept or enter a sub-menu. Or you can use your mouse to select the item you want. тАвтАв When the system is not stable as usual, select the Load Optimized Defaults item to set your system to its defaults. тАвтАв The BIOS Setup menus described in this chapter are for reference only and may differ by BIOS version. total memory size, CPU temperature, Vcore, and memory voltage. This screen provides information on CPU/memory frequencies/parameters. This item is configurable only when CPU/PCIe Base Clock is set to Manual. preset host clock multipliers. This item is configurable only when CPU/PCIe Base Clock is enabled. Displays the current operating CPU frequency. Allows you to set the CPU Uncore ratio. The adjustable range is dependent on the CPU being used. Displays the current CPU Uncore frequency. Intel┬о CPUs' unique features, please visit Intel's website. specified power limit, the CPU will automatically reduce the core frequency in order to reduce the power. supports this function. This feature only works for operating systems that support multi-processor mode. CPU core frequency and voltage will be reduced during system halt state to decrease power consumption. average power consumption and heat production. Auto lets the BIOS automatically configure this setting. is the memory frequency that is automatically adjusted according to the System Memory Multiplier settings. (Note 2) This item is present only when you install a memory module that supports this feature. Allows the system to operate at three different performance levels. Lets the system operate at its basic performance level. Lets the system operate at its best performance level. to be configurable. Options are: Auto (default), Quick, Expert. display the value based on the SPD data on the XMP memory. the board to default values by loading optimized defaults or clearing the CMOS values. This section provides CPU voltage control options. This section provides Chipset voltage control options. This section provides memory voltage control options. This item is present only when you install a memory module that supports this feature. show "No" at next boot. the CMOS, and then restart your system. Displays the current system voltages. Displays current CPU/system fan speeds. CPU_FAN connector and adjust the fan speed. Allows the fan to run at slow speeds. Allows you to control the fan speed under the Slope PWM item. Allows the fan to run at full speeds. to Manual. Options are: 0.75 PWM value /oC ~ 2.50 PWM value /oC. SYS_FAN connector and adjust the fan speed. is set to Manual. Options are: 0.75 PWM value /oC ~ 2.50 PWM value /oC. language used by the BIOS and manually set the system time. Selects the default language used by the BIOS. key to set the desired value. BIOS settings; the User level only allows you to make changes to certain BIOS settings but not all. first priority on the Hard Drive BBS Priorities submenu will be presented here. list. 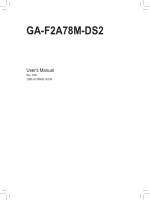 To boot from an operating system that supports GPT partitioning, select the device prefixed with "UEFI:"
the optical drive that contains the Windows 7 64-bit installation disk and is prefixed with "UEFI:" string. for this type is installed. Specifies whether a password is required every time the system boots, or only when you enter BIOS Setup. A password is only required for entering the BIOS Setup program. Technology will allow a platform to run multiple operating systems and applications in independent partitions. Enables or disables UEFI CSM (Compatibility Support Module) to support a legacy PC boot process. Disables UEFI CSM and supports UEFI BIOS boot process only. This item is configurable only when OS Type is set to Windows 8 or Windows 8 WHQL. Allows you to select which type of operating system to boot. Allows booting from operating systems that only support legacy option ROM. Allows booting from operating systems that only support UEFI option ROM. This item is configurable only when CSM Support is set to Always. Allows you to select whether to enable the UEFI or legacy option ROM for the storage device controller. Enables UEFI option ROM only. Enables legacy option ROM first. Enables UEFI option ROM first. than the LAN, storage device, and graphics controllers. Enables legacy Option ROM only. Enables or disables IPv4 PXE Support. This item is configurable only when Network stack is enabled. Enables or disables IPv6 PXE Support. This item is configurable only when Network stack is enabled. <Enter>. You will be requested to confirm the password. Type the password again and press <Enter>. Setup. However, the user password only allows you to make changes to certain BIOS settings but not all. <Enter> again when prompted to confirm. card or the onboard graphics. Sets the onboard graphics as the first display. Sets the graphics card on the PCI slot as the first display. Allows you to determine the operating mode for the xHCI controller in OS. routs ports to EHCI. Note: This is the recommended mode when BIOS has xHCI preboot support. shared ports are eventually routed to the xHCI controller during the BIOS boot process. mode. If the OS does not provide support, all sharable ports won't work. 3.0/2.0 port to xHCI or EHCI. Allows you to allocate the DVMT memory size of the onboard graphics. Options are: 128M, 256M, MAX. Enables or disables Intel┬о Rapid Start Technology. This item is configurable only when an SSD is installed. Configures the SATA controller to IDE mode. Enables RAID for the SATA controller. (Enhanced Parallel Port), ECP Mode (Extended Capabilities Port), EPP Mode & ECP Mode. This sub-menu provides information on LAN configuration. up day: Turn on the system at a specific time on each day or on a specific day in a month. up hour/minute/second: Set the time at which the system will be powered on automatically. AC power, or the settings may not be effective. up, power on by mouse, power on by keyboard, and wake on LAN. Configures the way to turn off the computer in MS-DOS mode using the power button. button is pressed for less than 4 seconds, the system will enter suspend mode. Determines the state of the system after the return of power from an AC power loss. The system returns to its last known awake state upon the return of the AC power. Press any key to turn on the system. Press POWER button on the Windows 98 keyboard to turn on the system. Set a password with 1~5 characters to turn on the system. Set the password when Power On by Keyboard is set to Password. Press <Enter> on this item and set a password with up to 5 characters and then press <Enter> to accept. To turn on the system, enter the password and press <Enter>. again without entering the password to clear the password settings. Move the mouse to turn on the system. Click Double click on left button on the mouse to turn on the system. program. Select No or press <Esc> to return to the BIOS Setup Main Menu. in BIOS Setup to the CMOS. Select No or press <Esc> to return to the BIOS Setup Main Menu. the BIOS or after clearing the CMOS values. to confirm. Your system will restart automatically and boot from that device. HDD/USB/FDD to save the profile to your storage device. properly (last known good record). with identical model and capacity). If you do not want to create RAID, you may prepare only one hard drive. тАвтАв Windows 8/7 setup disk. port on the motherboard. Then connect the power connector from your power supply to the hard drive. refer to Chapter 2, "BIOS Setup," "Integrated Peripherals." SATA Channel is enabled under Peripherals. Set OnChip SATA Type to RAID. settings and exit BIOS Setup. Refer to "C-2" for more information. The BIOS Setup menus described in this section may differ from the exact settings for your motherboard. This mode supports Windows 8 64-bit installation only. the changes and exit BIOS Setup. installed). Next, use the down arrow key to move to Select Disks. on the hard drives to be selected (selected hard drives are marked with "X"). Then set the stripe block size . 5. After setting the capacity, move to Create Volume and press <Enter> to begin. to check for information on RAID level, stripe block size, array name, and array capacity, etc. installation of Windows operating system for a non-RAID configuration. says "Press <Ctrl-I> to enter Configuration Utility". Press <Ctrl> + <I> to enter the RAID Configuration Utility. Create RAID Volume in MAIN MENU and press <Enter>. the hard drives being installed). Press <Enter> to proceed. can be set from 4 KB to 128 KB. Once you have selected the stripe block size, press <Enter>. BIOS utility, press <Esc> or select 6. Exit in MAIN MENU. With the correct BIOS settings, you are ready to install Windows 8/7. 1. Copy the IRST folder under BootDrv in the driver disk to your USB thumb drive. you to load the driver appears, select Browse. icon to individually install the drivers you need. to a third party nor be used for any unauthorized purpose. at the time of printing. GIGABYTE cannot, however, assume any responsibility for errors or omissions in this text. as a commitment by GIGABYTE. most of the materials in your "end of life" product. GIGABYTE are continuing our efforts to develop products that do not use internationally banned toxic chemicals. separately, and disposed of properly. resources and ensure that it is recycled in a manner that protects human health and the environment. waste collection administration for recycling. Customer Care number listed in your product's user's manual and we will be glad to help you with your effort. shipping containers) this product was delivered in, and by disposing of or recycling used batteries properly. You may go to the GIGABYTE website, select your language in the language list on the top right corner of the website. Then select your language to enter the system.